Go ahead and scroll down below the video to begin learning more about the latest version of the Toyota Tundra. Where do we get these Tundra reviews? From prominent writers in their industry. Loaded with important specs and information, each paragraph gives you complete access to all the Toyota Tundra has to offer. As always, Kenny Kent Toyota is available seven days a week to answer any questions you might have. Don't hesitate to call and speak with a representative. Check out the 2013 Toyota Tundra head-to-head with versus similar autos like the 2013 Ford F 150, Dodge Ram, Chevrolet Silverado and the GMC Sierra, and you will realize that the 2013 Tundra transcends those vehicles in oodles areas. Get a load of the reasons see why! 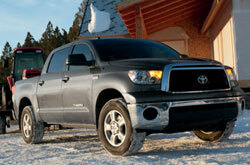 To get your Toyota Tundra worked on by spectacular service techs, you don't need to look far. Our Evansville auto service center is a brief trip away and we offer a full year warranty on every job. Toyotas in Evansville can take a whipping, so turn to the auto repair wizards in Evansville - Kenny Kent Toyota. Just a portion of the services our Toyota repair men do includes windshield wiper replacement, electronics repair and easy regular multi-point inspections. 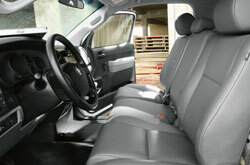 Moreover, Kenny Kent Toyota offers one of a kind customer service and thrifty prices. When you make a trip to Kenny Kent Toyota's service department, take advantage of insane savings with our the latest specials. Click below this text!